Lord Howe Island – an adventure playground for divers! Lord Howe Island is like a perfectly designed adventure playground for divers: from shallow fish-filled lagoon reefs, to the gullied terrain of the Arches, and jumbled bommies of the Admiralty Islands. 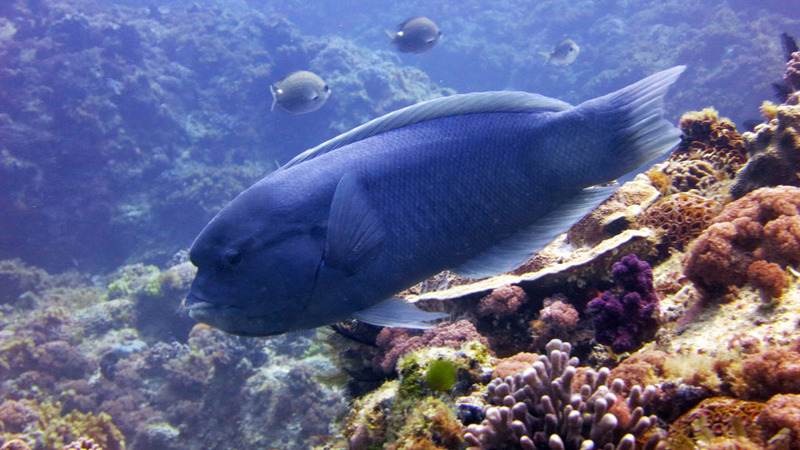 The surrounding waters are largely marine sanctuary and present a diversity unlike any other place in NSW. Even as you approach from the air, Lord Howe Island looks invitingly like an adventure playground for divers. Its irregular shape gives a little insight into what lies below the waterline: to the south the mighty peaks of Gower and Lidgbird stand like sentinels, their heads at 800m in the clouds and their almost vertical sides plummeting straight down into the water surrounding them, whilst dotted around are small islands and off to the south-east the unmistakable outline of Ball’s Pyramid pierces the horizon. On the north of Lord Howe, the ridgeline of Malabar shields the island from the north wind and connecting the two ends are a jumble of low hills overlooking a magnificent shallow lagoon, the submerged reefs and bommies clearly visible as the plane skims across it to the short runway on the only flat section of the island. Being an isolated rocky island about 1,000 km due east of Port Macquarie it is New South Wales most distant outpost. It’s also on the confluence of five different ocean currents – one consequence of which is that it has the world’s most southern coral reef, and another is that you’ll find species here that are found nowhere else world. It also makes a diving weather dependent as even the slightest breeze has a lot of runway before it hits the island. But don’t worry, the local dive centre is very knowledgeable about exactly how the weather affects diving conditions around the island and as the weather is likely to change during the course of the week it’s simply a matter of picking off the best dive areas one by one as conditions become ideal. Each area has a dozen or so sites and still many reefs and bommies around the back of the island that are yet to be explored. Lord Howe, the remains of an ancient volcano, is actually also surrounded by a second, older reef, one that was submerged when sea levels rose after the last ice age, and this reef system is largely unexplored. All things being equal, a great introduction to Lord Howe is to start with the Admiralty Isles to the north – with names like Sugarloaf and Tenth of June – you’re sure to find something interesting. The islands are surrounded by a jumble of bommies and you’ll meet the endemics straight off: the double-headed wrasse, the Lord Howe Island butterflyfish and maybe that rarity the conspicuous angel fish. 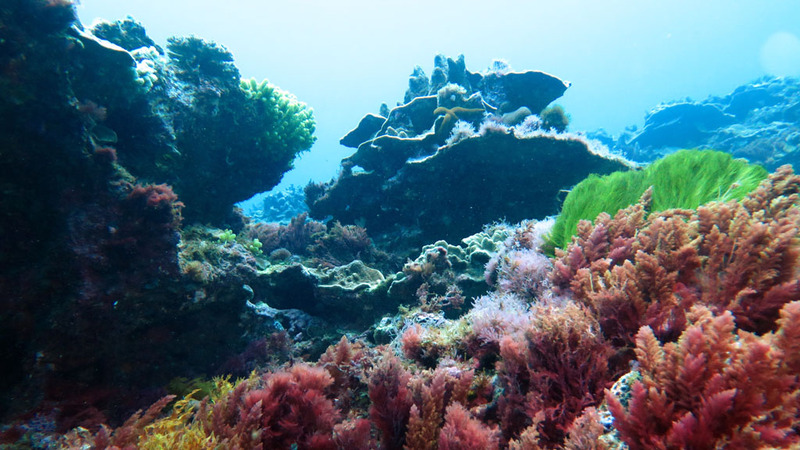 The other thing you’ll notice is the colour scheme: the whole place is decorated in a diverse combination of red soft coral, green algae and weed, sponges of all colours, chunky purple leather corals and brown hard corals. 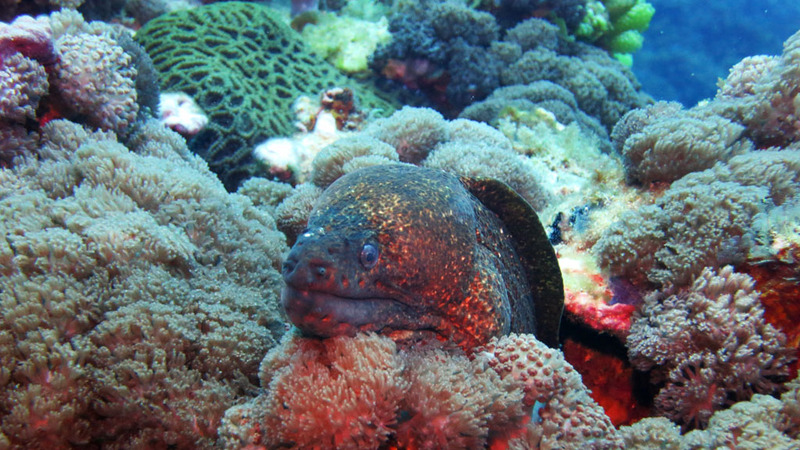 Amongst the jumble there are many morays, and in the sandy patches often a resting ray. It’s the perfect place for a morning double dive with a surface interval in the sheltered bay of Ned’s beach. For an easy dive in almost any weather, the Arches is the definitive adventure playground for divers. Long deep channels with plenty of overhangs and side caves have been carved through the coral bommies – just the right width for a diver. 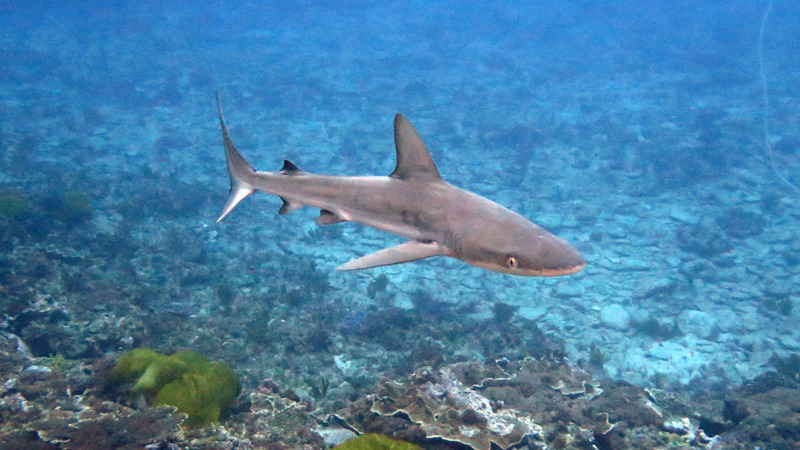 There you’ll encounter the bigger fish like sweetlips, trevally and wrasse hanging in the sheltered spots whilst Galapagos sharks – the most common shark species here – patrol the gullies. The walls are decorated with starfish and home to an array of morays and slipper lobsters. 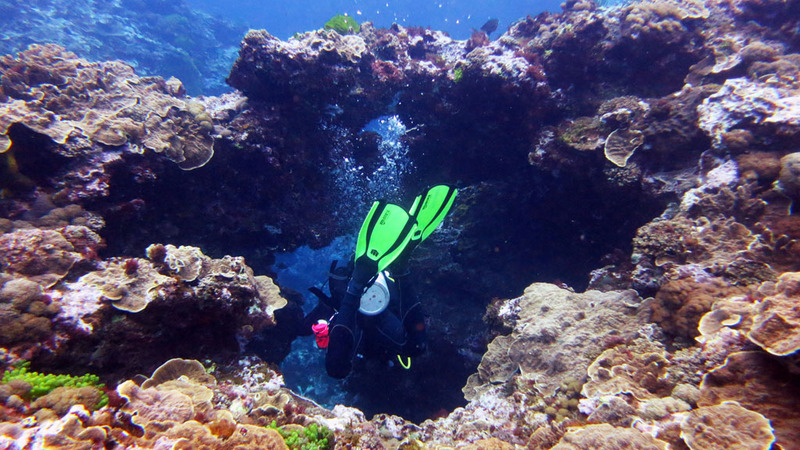 A great second (or even third) dive out in the lagoon are Comets Hole and are Erscotts Hole, both like circular swimming pools just 7m deep with a low coral wall around the edge. Both like a microcosm of everything that Lord Howe has on offer which somehow seems more vividly colourful than the NSW’s dive sites at home. 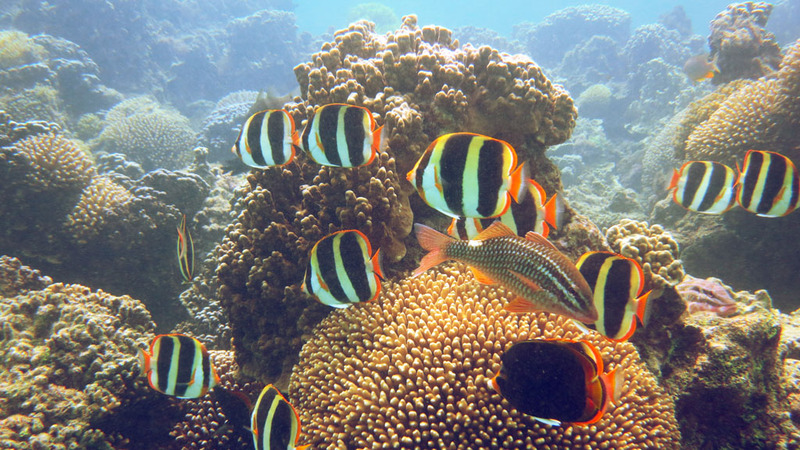 The Lord Howe butterflyfish are not yellow but burnished gold, the morwongs are deep orange-red except for the cute little zebra morwongs which are pure black and pure white. The wrasse are either the deep blue of the doubleheader or the vivid rainbows of the ladder wrasse: red, green and ultramarine. As much of ocean surrounding Lord Howe is zoned marine sanctuary, the numbers of fish is greater too: lined catfish swarm in their thousands while hosts of silver drummer appear to be happily singing as they bumbled by. A few random kingfish might fly overhead followed by the ever present Galapagos sharks whilst you’re down on the sand creeping up on a resting bull ray. Both dive sites are the kind where you could get straight back in again and see another whole different set of marine life. Lord Howe has daily flights from Sydney and plenty of reasonably priced accommodation. 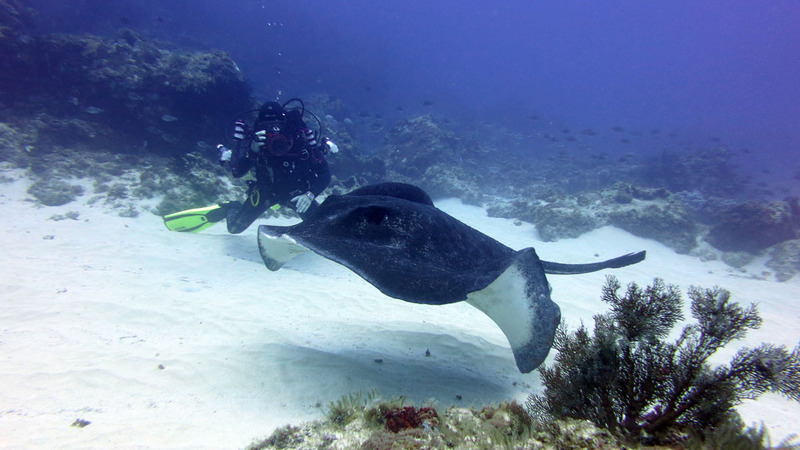 You can research a dive trip to Lord Howe Island on Diveplanit. Previous Previous post: What you need to know about drift diving.